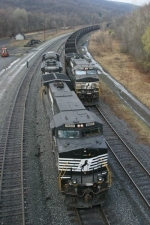 Description: Switching coal cars in North Yard; NS 9508 pushes empty coal train into siding, while 9688 and 2678 wait. Description: NS general freight 33A charges east through the "s" curve at CP Tulp on the Reading Line behind SD70M-2 2678 on a bright evening in the Reading area. Description: NS 2678 along with CSXT units. Description: NS SD70M-2 rolls east around his train of Conrail stone hoppers near Dyers Quarry on the Turkey Path. Description: Stone train H48 heads west to the quarry at Annville. Description: Eastbound on track two crossing over Saucon Creek. Description: NS B-32 waits on the Red Key's North Siding for 51a grain Train to clear CP -79 before heading for Indianapolis. Description: NS B-32 pauses on the Red Key's North Siding waiting for 51A Grain Train to clear CP-79 before backing onto the Marion Branch bound for Hawthorn Yards in Indianapolis. Description: A short B-32 waits for a NS 51A Northbound Grain Train to clear CP-79 before departing for Indianapolis. Description: Slightly blurred by heat-wave distortion, an eastbound mixed freight led by new NS SD70M-2 #2678 approaches Osborn Junction on the ex-NKP mainline. Description: 21E makes the last surge upgrade has it heads towards the tunnels and the summit. Description: Westbound on track two as his headlight reflects on a small puddle. That is the MP 302 Pennsy Signal Bridge in the background. Description: Westbound on track one where it will crossover to track two at CP Trobe. Description: NS train 330 creeps up to the north end of Sycamore siding, ready to meet 151.